I’m going through one of my fruit obsessions right now. I’m all about the pomegranates. I’ve been enjoying them plain, in smoothies, and, of course, I had to make a dessert of out them. The little red jewels add so much color this time of year when everything is drab and brown (Although we finally did get some snow to brighten things up). I usually love snow, but this week I was commuting to work from a hotel in Delaware where Tyler has training. It’s not as far as I usually drive, but the drive is almost entirely through town, none of the pretty Amish countryside I usually see. Anyway, the snow made the drive over 2 hours long and all I got to see was the brown slush under the tires of the car in front of me. And snow usually makes me so happy! So I had fun editing some pretty cupcake pictures that evening (Eating one would have been even better, but they were long gone!). 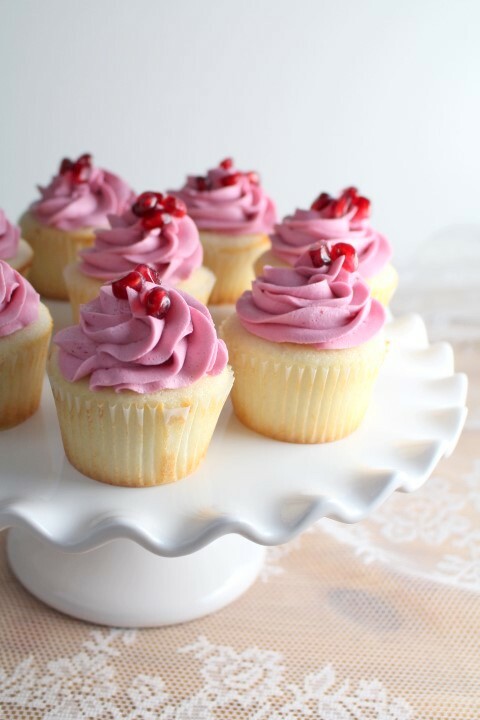 Since I make so many dessert recipes for the blog, I rarely eat more than one piece of anything before gladly giving them away, but I didn’t feel one bit guilty for each almost the entire batch of these pomegranate cupcakes myself. I’ve found my go-to white cupcake recipe. I adapted this white cake recipe from I Am Baker (and by adapted I mean I barely changed around 2 ingredients. No need to reinvent an amazing recipe.) 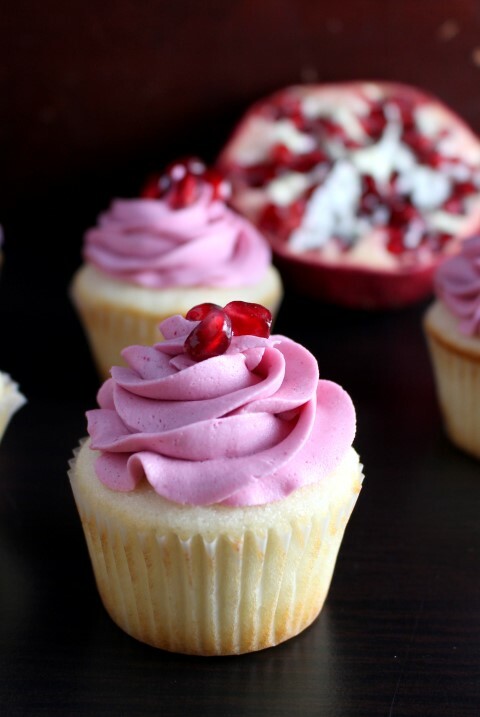 The frosting is a basic buttercream with reduced pomegranate juice. The beautiful pink color of the frosting came solely from the pomegranate juice, no need for food coloring. Line muffin tins with 24 cupcake liner. Preheat oven to 350 degrees F. Whisk together the wet ingredients, the milk, egg white, almond and vanilla extract. In the bowl of a stand mixer fitted with the whisk attachment, mix together the cake flour, white sugar, baking powder and salt on low speed. Cut the butter into cubes and add to the mix. Beat on low until crumbly (about 1 to 2 minutes. Pour all but 1/2 cup of the wet ingredients into the dry. Beat on a medium speed for about 1 and 1/2 minutes. Add the remaining wet ingredients and beat for another 1 minute. Pour batter into the prepared pans filling them about 2/3 full. Bake in the preheated over for 14-15 minutes or until a toothpick inserted comes out clean. Remove from the pans to a wire rack and allow to cool completely. 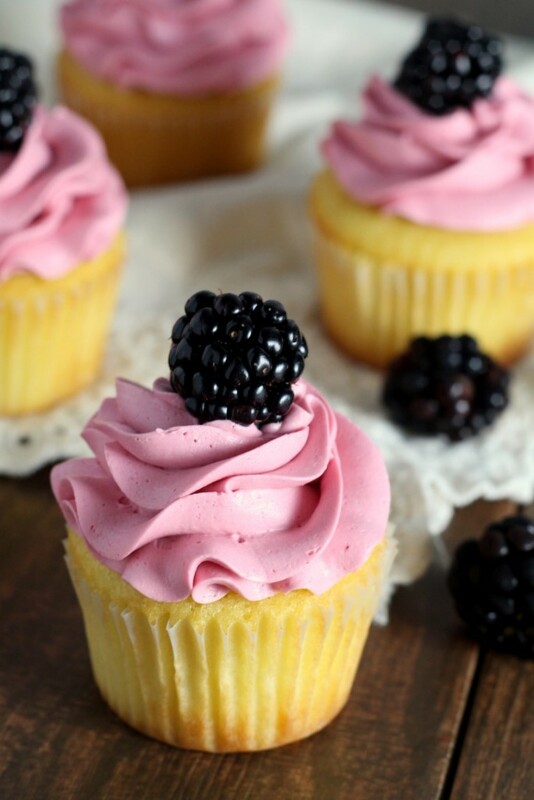 Check out these other cupcakes that are perfect for special occasions! Chocolate Covered Strawberry Cupcakes – This was the first post I ever wrote, please be forgiving to my photography and pictures, but the cupcakes themselves are amazing! These cupcakes look so light and airy. I am sure they are sensational. Love the pop of pink in the frosting! Ohh, these look perfect. I love that you used Pomegrantes to color the icing. Genius. I’m not sure which I look forward to trying more, the cupcake or the buttercream. 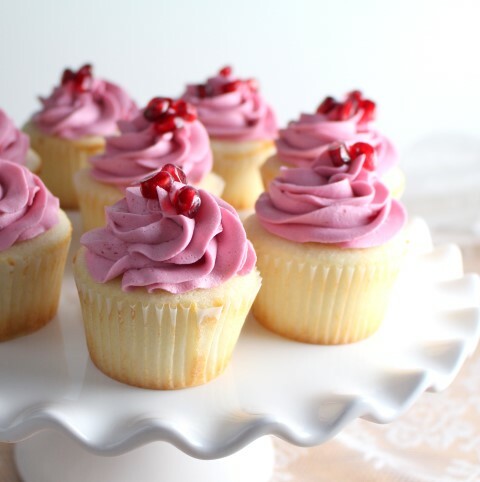 The cupcakes remind me of a childhood favorite with a gorgeous update using pomegranate juice. These are SO gorgeous! And I love that that frosting is *such* a pretty pink with no food coloring needed. Such pretty cupcakes! Perfect for Valentine’s Day! These cupcakes are so beautiful, Mallory! 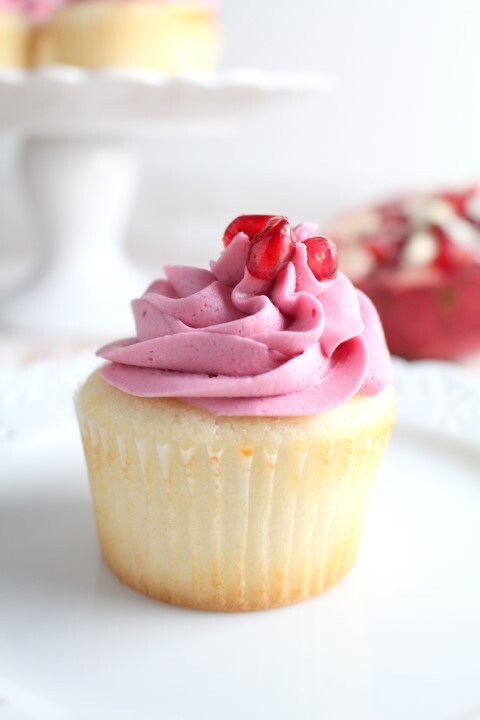 Vanilla cupcakes are such a favorite and they sound amazing with the pomegranate frosting. Love the natural pink color too!! These cupcakes are almost too pretty to eat! Notice I said almost! These are just gorgeous!! I love Amanda’s white cake in her book so I can just imagine these are crumbly good. Yes! Pomegranates are just the yummiest thing ever!! I love your cupcakes – so pretty!! These cupcakes are stunning, Mallory! 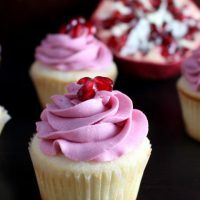 The pomegranate frosting is so creative and it sounds delicious! These cupcakes look phenomenal!! I love the pink color of the frosting too! I love everything about these cupcakes! So fun and creative! These turned out gorgeous! I would turn down a cupcake even in ‘healthy’ January! Wow! These are absolutely stunning! I love that you concentrated the juice down for the frosting and that the cupcakes are homemade! Hi there. I am looking forward to trying this recipe but I am a little confused about the amount of pomegranate juice. There seems to be conflicting amounts written down. How much juice should I begin with and how much liquid should be left when I add it to the buttercream? I am confused also about the amt. of pomegranate juice. Is it one cup reduced to 1/2cup as in the recipe or one cup reduced to 1/4 cup? hey, the recipe looks amazing! i would like to make these cupcakes tomorrow. the amount of pomegranate juice is unclear. how much do you start with and how much should it be reduced to? Hi Nancy, I updated the recipe to hopefully be clearer. But you should start with 1/2 cup of juice and reduce it to 1/4 cup.